« White Horse Extra Fine 12 year blend. Fine indeed. The Original – Glenmorangie’s signature expression, aged 10 years and bottled at 43% for the U.S. market (and apparently 40% in the UK). It’s aged in ex-bourbon casks. The Lasanta – After 10 years in ex-bourbon casks, The Lasanta is aged an additional 2 years in Oloroso Sherry casks. The Quinta Ruban – Like The Lasanta, this 12 year old spends the first 10 years in ex-bourbon casks, but it’s then transferred to Ruby Port pipes for the final two years. The Nectar D’or – The final “extra matured” expression. This one is finished in Sauternes wine barriques. The 100 ml bottle size is nice, as it allows several tasting sessions in order to get a really good feel for what each expression is all about. This gift pack sells locally for $47. Obviously, this is a higher per-ml price for the whisky, but I was happy to pay the equivalent of a medium-priced whisky bottle in order to try all four of these expressions. The presentation for this gift pack is very impressive. They’ve recently repackaged this set with design cues taken from the ultra premium Signet packaging. In addition to the beautiful box and nice looking bottles, a fancy booklet is included that explains the maturation process for each expression, and provides tasting notes. Well done! Light, fresh nose with citrus and floral notes standing out (like orange blossoms). Also a fair amount of vanilla, and maybe a hint of wood. The mouth stays light and fruity, and adds maltiness. The malt remains on the medium finish, along with a reminder of the orange blossoms. A definite sherry influence in the form of dried fruits. The sherry seems to do battle on the nose with the light citrus/floral notes from the original. It brought to mind musty carpet for some reason. The mouth is pretty nice, actually, with a little more body than the The Original. Then the sherry and bourbon are back to doing battle on the finish. I find it a bit disconcerting. This is different. The citrus and floral notes are toned way down, and out comes a strong chocolate scent. Actually, the orange is still there, but balanced nicely with the chocolate. The mouth is pleasant and malty like The Original. On the finish…chocolate malt. What a great dessert drink. The least finished feeling of the three extra matured expressions. D’or is a natural extension of The Original, with the orange blossoms toned down (maturity? ), and the vanilla coming through stronger and richer, with added cinnamon and nutmeg. Very seductive! The palate seems spicier than any of the others, with the finish remaining spicy and bringing out a hint of the chocolate from The Quinta Ruban. An even better dessert malt? 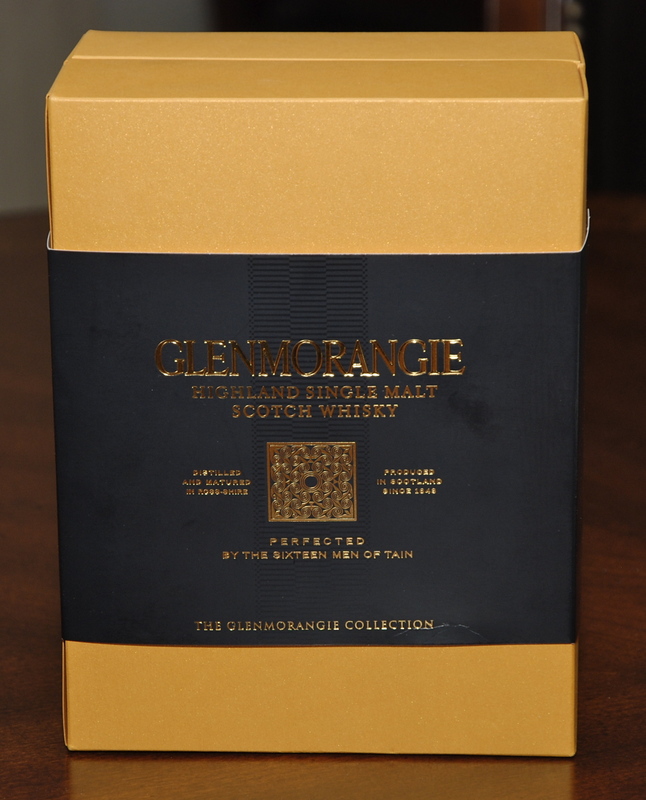 If you’re not already familiar with all four of these Glenmorangie expressions, I can highly recommend this gift pack. It looks good, has a nice booklet on the malts, and gives you a chance to try the whole line without committing big money and cupboard space. As for my impression of the whiskies themselves, I really like the The Original. I would put it on fairly equal footing with Bunnahabhain 12 year in terms of overall enjoyment. The Glenmo Original is probably a bit more complex than the Bunna. When in the mood for a light, malty whisky, I would turn to the Bunna for cinnamon apples, and the Glenmo when in the mood for orange blossoms. Getting into the finished expressions (sorry, “extra matured“), I would put Nectar D’or at the top, Quinta Ruban right below that, and Lasanta several notches down. I don’t like to do full ratings until I’ve had a chance to try a whisky a number of times. However, I’ll throw out some preliminary ratings of 80-ish/100 for Lasanta, 84 for The Original, 85/86 for Quinta Ruban, and 87/88 for Nectar D’or. WHISKYFUN by Serge – Separate reviews of The Original and the Extra Matured expressions. Nectar D’or comes out on top here with a similar rating of 86. However, the other expressions are rated much lower than I felt they deserved. Serge especially differs from me when it comes to The Quinta Ruban. Malt Advocate (review archives) – Wow, John Hansell really likes The Original, giving it 93 points! Nectar D’or gets a respectable 89. Lasanta doesn’t do as well, with 79 points. whisky-pages – Gavin and Tom seem to like all four expressions, with The Original and The Quinta Ruban rated a little better than the other two. caskstrength.net – [Added 10/6/09] I missed this review the first time around. Thanks for the heads up, Joel. 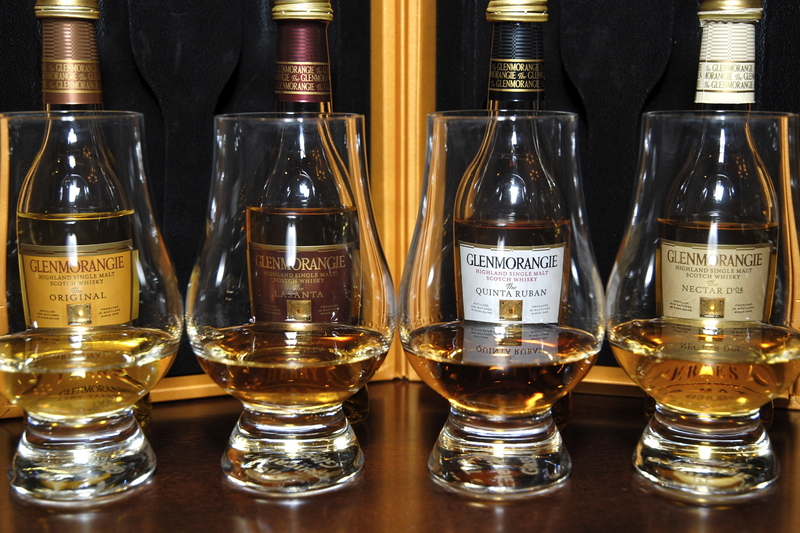 A great overview of these Glenmorangies, plus the 25 year. They enjoy the original and seem equally puzzled by the Lasanta, but are a little less enthusiastic about the D’or than I am. In fact, I’d put the Nectar D’Or up a notch or two from your position – saying it’s the *best* “dessert malt” under $100 (even under $150) I’ve tasted. It’s truly sweet treat with some amazing complexity & very enjoyable. A good intro for folks who *assume* whiskies are peaty/smoky or overly malted/oaky tasting. Just something very different. The QR was, like for you, the one that left me “eh” – it’s good, and certainly worthy of it’s stand-alone price, but it didn’t appeal to me nearly as much as the other three. I’ve since had a chance to tray Astar & Signet and they both hold up to these “base”/foundation expressions – each being richer/fuller in their own rights than these – especially the Signet, which tastes as good as it’s price would suggest! Thanks for sharing your thoughts on these expressions! Where did you find this set in Michigan? I’m looking for a gift for a newer whiskey drinker and know nothing about buying it myself…. I’m in the Holland/Grand Rapids area…any ideas where I should look?…I’m thinking not just any ol’ liquor store will have this? It’s pretty common around here – most of the bigger “real” liquor stores (i.e. not gas stations or grocers with liquor) seem to have it. Good luck – just make a few calls first, to save gas. And ask if they honor “state minimum pricing” – that way you know it’ll be this price! would love to get my hands on that. i am very weak in my Glenmo education, and i need to try more glenmo’s. very nice post. i wish i got those kind of presents from friends/family. jeff, u nailed another cool post. Thanks for the kind words, Gal! If the price is right, I think both the 10 year and the D’or are pretty safe buys. For the others, there’s probably a little more risk in terms of how you’re going to react to the finish. Hopefully you can find the gift pack someplace that will ship to you. Nice review Jeff. You make me want to run out and buy the sample pack again (or maybe a bottle of the Quinta or Nectar). I guess we just differ in where we place the Lasanta and the Original. Hey Sean, thanks for stopping by. If we could get this pack for $29 here like Tim can in Michigan, it would be a no brainer! I’m curious to see if I warm up more to the Lasanta after a couple of more tries. I really wanted to like it more. I’ve bought two of these sets in Michigan, for around $30, and I concur that it is a fantastic way to taste these great drinks. That’s such a great deal you guys have going in Michigan! And yes, it’s a personal thing, except in this case you’re just plain wrong about the D’or. just bought the Nectar D’or. will post my notes next week when it gets here. Looking forward to your notes. Taking a break from the peat monsters, eh? Nice drams. Shame they all sounds like Toyota cars! Thanks Joel. Sorry I missed your post the first time around. I’ve added a link up in the “Other opinions” section in my post. pack is 21.99 here in New Hampshire! I bought this pack for exactly the same reasons as Jeff – a budding connoisseur with very little money! I can also highly recommend it (I think I got mine for £27 or so in the UK – what’s going on with the pound-dollar exchange rate?!) for it benefited me on two counts: I got to taste two more expressions and developed an understanding with the Original which had blown hot and cold for me in past tastings no matter how hard I tried to like it. After tasting the QR, I didn’t want to rank the NdO higher, so gorgeously rich and spicy was the Port-finished dram. However, a second tasting of the NdO alongside the Original and the QR revealed the Sauternes finish to be a more complete malt – but only just! I think I still prefer the QR’s rich, dark heat and more assertive cask influence overall, but the balance of sweetness and classic Glenmo flavours in the NdO must be tasted to be believed. For me, NdO, QR, LS and then the Original. Thanks for the comments James. That’s funny…I tend to bounce back and forth a bit between QR and NdO as well! It’s somewhat dependent on mood and situation. Now I’m thinking I might like Sonnalta better than any of them! 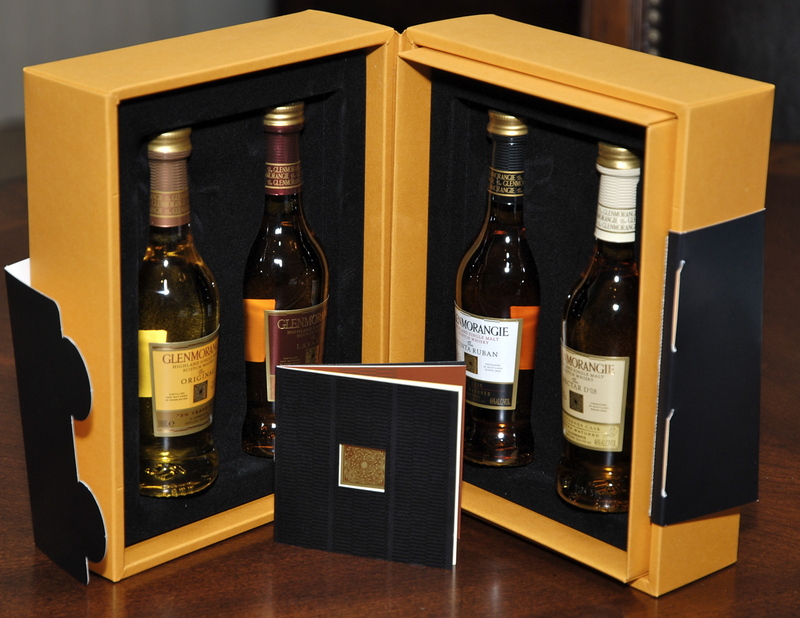 Glenmorangie made a little change to the gift pack this year. The set I purchased at Bevmo for $35.99 has a full 750 mL bottle of the 10 year old while the other three expressions were downsized to 50 mL samples. Still considering the full size 10 year old by itself was 33.99, I found the price completely worth it. I assume you’ve already checked at Binny’s in Chicago?